Teachers play various roles in a typical classroom, but surely one of the most important is that of classroom manager. Effective teaching and learning cannot take place in a poorly managed classroom. If students are disorderly and disrespectful, and no apparent rules and procedures guide behavior, chaos becomes the norm. In these situations, both teachers and students suffer. Teachers struggle to teach, and students most likely learn much less than they should. In contrast, well-managed classrooms provide an environment in which teaching and learning can flourish. But a well-managed classroom doesn't just appear out of nowhere. It takes a good deal of effort to create—and the person who is most responsible for creating it is the teacher. Researcher Kati Haycock (1998) uses the findings of this study and others conducted by William Sanders and his colleagues (e.g., Sanders & Horn, 1994) to paint a dramatic picture of the profound impact an individual teacher can have on student achievement. The point is illustrated in Figure 1.1, which depicts the differences in achievement between students who spend a year in class with a highly effective teacher as opposed to a highly ineffective teacher. According to Figure 1.1, students in the classes of teachers classified as the most effective can be expected to gain about 52 percentile points in their achievement over a year's time. Students in the classes of teachers classified as least effective can be expected to gain only about 14 percentile points over a year's time. This comparison is even more dramatic when one realizes that some researchers have estimated that students will exhibit a gain in learning of about 6 percentile points simply from maturation—from growing one year older and gleaning new knowledge and information through everyday life (see Hattie, 1992; Cahen & Davis, 1987). The least effective teachers, then, add little to the development of students' knowledge and skill beyond what would be expected from simply growing one year older in our complex, information-rich society. Sanders and his colleagues, who gathered their data from elementary school students in Tennessee, are not the only ones to document dramatic differences in achievement between students in classes taught by highly ineffective versus highly effective teachers. Haycock (1998) reports similar findings from studies conducted in Dallas and Boston. I have come to similar conclusions in my work, although I have taken a very different approach from that used in the studies that form the basis for Haycock's conclusions. Whereas the studies conducted in Tennessee, Dallas, and Boston were based on data acquired from students over time, I used a research process called meta-analysis to synthesize the research on effective schools over the last 35 years (see Marzano, 2000a, 2003b). That approach enabled me to separate the effect on student achievement of a school (in general) from the effect of an individual teacher. Figure 1.2 illustrates my findings. To understand the impact that a teacher can make, let's consider each of the five scenarios in Figure 1.2. (For a detailed discussion of how the computations in Figure 1.2 were derived, see Marzano, 2000a.) As depicted in Figure 1.2, if a student begins at the 50th percentile in mathematics, let's say, and attends an average school and has an average teacher, her achievement will still be at the 50th percentile at the end of about two years. The student has learned enough to keep pace with her peers. But what happens to that student if she attends a school that is considered one of the least effective and is unfortunate enough to have a teacher who is classified as one of the least effective? After two years she has dropped from the 50th percentile to the 3rd percentile. She may have learned something about mathematics, but that learning is so sporadic and unorganized that she has lost considerable ground in a short time. In the third scenario, the same student is in a school classified as most effective, but she has a teacher classified as least effective. Although the student entered the class at the 50th percentile, two years later she leaves the class at the 37th percentile. In contrast to the two previous scenarios, the fourth presents a very optimistic picture. The student is not only in a school classified as most effective, but also is in the class of a teacher classified as most effective. She enters the class at the 50th percentile, but she leaves at the 96th percentile. The fifth scenario most dramatically depicts the impact of an individual teacher. Again, the student is in a school that is considered least effective, but she is with a teacher classified as most effective. The student now leaves the class at the 63rd percentile—13 percentile points higher than the point at which she entered. It is this last scenario that truly depicts the importance of individual teachers. Even if the school they work in is highly ineffective, individual teachers can produce powerful gains in student learning. Although the effect the classroom teacher can have on student achievement is clear, the dynamics of how a teacher produces such an effect are not simple. Rather, the effective teacher performs many functions. These functions can be organized into three major roles: (1) making wise choices about the most effective instructional strategies to employ, (2) designing classroom curriculum to facilitate student learning, and (3) making effective use of classroom management techniques. The first role deals with instructional strategies and their use. Effective teachers have a wide array of instructional strategies at their disposal. They are skilled in the use of cooperative learning and graphic organizers; they know how best to use homework and how to use questions and advance organizers, and so on. Additionally, they know when these strategies should be used with specific students and specific content. Although cooperative learning might be highly effective in one lesson, a different approach might be better in another lesson. Some general strategies that have a good research “track record” in terms of enhancing student achievement have been detailed in Classroom Instruction That Works: Research-Based Strategies for Increasing Student Achievement (Marzano, Pickering, & Pollock, 2001). The second role associated with effective teaching is classroom curriculum design. This means that effective teachers are skilled at identifying and articulating the proper sequence and pacing of their content. Rather than relying totally on the scope and sequence provided by the district or the textbook, they consider the needs of their students collectively and individually and then determine the content that requires emphasis and the most appropriate sequencing and presentation of that content. They are also highly skilled at constructing and arranging learning activities that present new knowledge in different formats (e.g., stories, explanations, demonstrations) and different media (e.g., oral presentations, written presentations, video presentations, Web-based presentations, simulations, hands-on activities). The third role involved in effective teaching is classroom management. This, of course, is the subject of this book. The following chapters detail and exemplify the various components of effective classroom management. Arguably, the first high-profile, large-scale, systematic study of classroom management was done by Jacob Kounin (1970). He analyzed videotapes of 49 first and second grade classrooms and coded the behavior of students and teachers. Kounin's findings are discussed in more depth in Chapter 5, but it is worth noting here that he identified several critical dimensions of effective classroom management. Those dimensions (among others) are (1) “withitness,” (2) smoothness and momentum during lesson presentations, (3) letting students know what behavior is expected of them at any given point in time, and (4) variety and challenge in the seatwork assigned to students. “Withitness” involves a keen awareness of disruptive behavior or potentially disruptive behavior and immediate attention to that behavior; of the four dimensions, it is the one that most consistently separates the excellent classroom managers from the average or below-average classroom managers. A series of four studies conducted at the Research and Development Center for Teacher Education in Austin, Texas, marked a milestone in the research on classroom management. The first study involved 27 elementary school teachers. The second involved 51 junior high school teachers. Results from the elementary school study were reported in Emmer, Evertson, and Anderson (1980) and Anderson, Evertson, and Emmer (1980). Results from the junior high study were reported in Evertson and Emmer (1982) and in Sanford and Evertson (1981). Both studies were descriptive and correlational in nature and identified those teacher actions associated with student on-task behavior and disruptive behavior. Again, Kounin's earlier findings were strongly supported. One of the more significant conclusions from these studies was that early attention to classroom management at the beginning of the school year is a critical ingredient of a well-run classroom. Together, these studies set the stage for research and practice in classroom management for the late 1980s through the 1990s and resulted in two books on classroom management: one for the elementary level (Evertson, Emmer, & Worsham, 2003) and one for the secondary level (Emmer, Evertson, & Worhsham, 2003); both are now in their sixth edition. To date, these books have been considered the primary resources for the application of the research on classroom management to K-12 education. In spite of the profound impact of these various studies, classroom management received its strongest endorsement in a comprehensive study by Margaret Wang, Geneva Haertel, and Herbert Walberg (1993). They combined the results of three previous studies. One involved a content analysis of 86 chapters from annual research reviews, 44 handbook chapters, 20 government and commissioned reports, and 11 journal articles. This analysis produced a list of 228 variables identified as having an impact on student achievement. The second study involved a survey of 134 education experts who were asked to rate each of the 228 variables in terms of the relative strength of their impact on student achievement. The third study involved an analysis of 91 major research syntheses. The end result of this massive review was that classroom management was rated first in terms of its impact on student achievement. In summary, the research over the past 30 years indicates that classroom management is one of the critical ingredients of effective teaching. 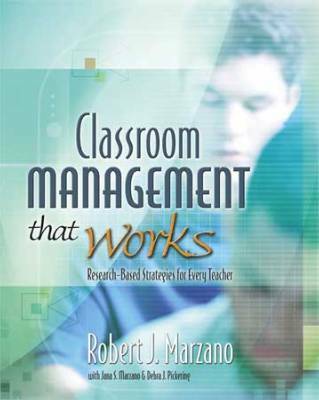 Many studies and many books have been published articulating the specifics of effective classroom management. So what does this book have to offer that has not already been established? Certainly, this book reinforces the findings and suggestions from many of the previous works. However, the recommendations in this book are based on a new research methodology not previously employed with the classroom management literature per se. That methodology is meta-analysis. Meta-analysis is an approach to research that was formally developed by researcher Gene Glass and his colleagues (see Glass, 1976; Glass, McGaw, & Smith, 1981) in the early 1970s. In simple terms, it is a technique for quantitatively combining the results from a number of studies. Since its inception, it has been used extensively in the fields of education, psychology, and medicine. The powerful impact that meta-analysis has made on these fields of study is chronicled in the book How Science Takes Stock: The Story of Meta-Analysis by Morton Hunt (1997). In effect, this research technique has allowed us to construct generalizations about education, psychology, and medicine that were previously not available. A logical question is, Why is the simple act of combining the findings from a number of studies so powerful? The answer is that any single study, no matter how well constructed, will have “uncontrolled error” influencing its outcomes. To illustrate, let's consider a well-designed study that examines the impact of a specific classroom management strategy on students' behavior. The study might randomly assign students to two groups—one that uses the strategy (the experimental group) and one that does not (the control group). The study might ensure that both groups do everything exactly the same except for the classroom management strategy that is being studied. Even with this level of tight control, the findings that come from the study might be influenced by uncontrolled error. For example, the way student behavior is measured might not be sensitive to behaviors that are important to the study; something might happen to the students in the experimental or the control group that is not related to the study but influences their behavior, and so on. In fact, it is almost impossible to control all the error that might creep into a study. This is why researchers assign a probability statement to their findings. When researchers report that their findings are significant at the .05 level, they are saying that there is a very small chance—less than 5 chances in 100—that their findings are a function of the uncontrolled error in the study. When researchers report that their findings are significant at the .01 level, they are saying that there is as an even smaller chance that the findings are a function of uncontrolled error—less than 1 chance in 100. By combining the results of many studies, we can say with far more certainty than we can with a single study that certain strategies work or do not work. This concept is considered again in more detail in Chapter 2. As shown in Figure 1.3, my meta-analysis addressed four general components of effective classroom management: (1) rules and procedures, (2) disciplinary interventions, (3) teacher-student relationships, and (4) mental set. The remaining chapters of this book address these factors (along with some others) in depth. However, let's briefly consider the meaning of the scores presented in Figure 1.3. The fourth column indicates the number of studies that were examined for each of the four components. The third column reports the total number of students involved in those studies. The second column presents the average effect size for each of the four general components of classroom management. Note: All effect sizes are significant at the .05 level. An effect size is a metric used in meta-analyses. In the context of this book, it tells you how much of a difference in behavior you can expect between classes that effectively employ a given aspect of classroom management and classes that do not. To illustrate, let's consider the average effect size for disciplinary interventions, as shown in Figure 1.3. It is −.909. This average was computed using the findings from 68 studies involving 3,322 students. An average effect size of −.909 can be interpreted to mean that in classes where disciplinary procedures were used effectively, the average number of classroom disruptions was .909 standard deviations less than the average number of disruptions in classrooms that did not effectively employ disciplinary procedures. One of the benefits of using the effect size metric is that we can translate it into a percentile change relative to the average number of disruptions that occur in a classroom. Let's think of a disruption as any type of student behavior not sanctioned by the teacher. A disruption can be as innocuous as a student talking to her neighbor or as severe as a student being disrespectful to the teacher. So, for this example, we are not distinguishing the severity of disruptions, only the number of disruptions. What does an effect size of −.909 for disciplinary interventions tell us? In this case, an effect size of −.909 translates into a decrease of 32 percentile points relative to the average number of disruptions in class. (For a discussion of how effect sizes are translated into percentile changes, see the Appendix.) This means that the average number of disruptions in classes where disciplinary interventions are employed effectively will be at the 18th percentile in terms of the distribution of disruptions in classes where disciplinary interventions are not employed effectively. To further understand the distribution of disruptive behavior, consider Figure 1.4. Let's assume that the average number of disruptions per day is 10 in classes where disciplinary interventions are not employed and that the standard deviation is 5.0. This is depicted in the distribution on the right of Figure 1.4. Given what we know about normal distributions, this implies that some days there will be many more disruptions than 10. In fact, we can predict that on some days the number of disruptions will be two standard deviations (or more) above the mean. That is, on some days there will be 20 disruptions in these classrooms. Conversely, some days the number of disruptions will be two standard deviations below the mean—some days there will be no disruptions. In other words, the classes that don't employ disciplinary interventions will have a few “low-disruption days” and a few “high-disruption days,” but the average number of disruptions will be 10 per day. Now let's consider the distribution on the left of Figure 1.4, which represents the classes that use disciplinary interventions effectively. Here the mean is 5.46 and the standard deviation is again 5.0. On high-disruption days, these classes will have 15.46 disruptions. On low-disruption days these classes will have none. In summary, Figure 1.4 indicates that classes that use disciplinary interventions will have their good days and bad days, as will classes that don't. However, the average number of disruptions in classes that use disciplinary interventions effectively is substantially fewer than in classes that don't. Over a year's time, this decrease in disruptive behavior results in a significantly different atmosphere in the two types of classes. Over a year's time, classes that employ disciplinary interventions will have about 980 disruptions, whereas classes that do not will have about 1,800. The effect sizes reported in Figure 1.3 make a strong case that effective use of classroom management techniques can dramatically decrease the disruptions in your classes. The results of my meta-analysis also demonstrate the impact of effective use of classroom management strategies on student engagement and student achievement (see Figure 1.5). Figure 1.5 reports that classes in which effective classroom management techniques are used have engagement rates for students that are .617 standard deviations higher than the engagement rates in classes where effective management techniques are not employed. This translates into a 23-percentile-point increase in engagement. Figure 1.5 also indicates that classes with effective classroom management techniques reach achievement levels that are .521 standard deviations higher than the achievement in classes without effective classroom management techniques. This translates into a 20-percentile-point increase in achievement. In other words, my meta-analysis indicates that, on the average, students in classes where effective management techniques are employed have achievement scores that are 20 percentile points higher than students in classes where effective management techniques are not employed. By a number of measures, then, effective classroom management has a powerful impact on students. Are Good Classroom Managers Born or Made? Although the characteristics of an effective classroom manager are clear and even somewhat intuitively obvious, what might not be as clear or obvious is how you become an effective classroom manager. You might ask the question, Are effective classroom managers born, or can you become one if you are not one already? Fortunately, the answer to this question is that effective classroom managers are made. Good classroom managers are teachers who understand and use specific techniques. Awareness of and training in these techniques can change teacher behavior, which in turn changes student behavior and ultimately affects student achievement positively. Again, research evidence supports this assertion. To illustrate, consider the research by Walter Borg and Frank Ascione (1982). In a study involving 34 elementary school teachers who were randomly assigned to experimental and control conditions, they found that (1) teachers who had been trained in the use of effective classroom management techniques (the experimental group) improved their use of those techniques when compared to a group of untrained teachers (those in the control group), and (2) the students of the teachers in the experimental group had fewer disruptions and higher engagement rates than those in the control groups. Similar findings were reported for minimal interventions for elementary school teachers by Emmer, Sanford, Evertson, Clements, and Martin (1981). The seven remaining chapters in this book cover various aspects of classroom management in greater detail. Chapter 2 addresses classroom rules and procedures. Chapter 3 discusses disciplinary interventions. Chapter 4 addresses teacher-student relationships, and Chapter 5 addresses mental set. Chapter 6 provides a different perspective on classroom management. Instead of considering what the teacher can do to enhance the management of the classroom, it considers the role of the student in the effective management of the classroom. In effect, it discusses student responsibility for classroom management. Chapter 7 considers how to begin the school year in a way that ensures a good start to management. Finally, in a shift from the individual-classroom perspective of Chapters 2 through 7, Chapter 8 considers the role of the school in the business of management. Each chapter begins with a consideration of the research and theory. Next, specific programs that are particularly strong in a given aspect of classroom management are considered. The heart of each chapter is a section entitled “Action Steps.” These are specific recommendations for you, the classroom teacher. Clearly, individual classroom teachers can have a major impact on student achievement. Of the three roles of the classroom teacher—making choices about instructional strategies, designing classroom curriculum, and employing classroom management techniques—classroom management is arguably the foundation. Research on classroom management supports this argument, as does the meta-analysis on which this book is based.